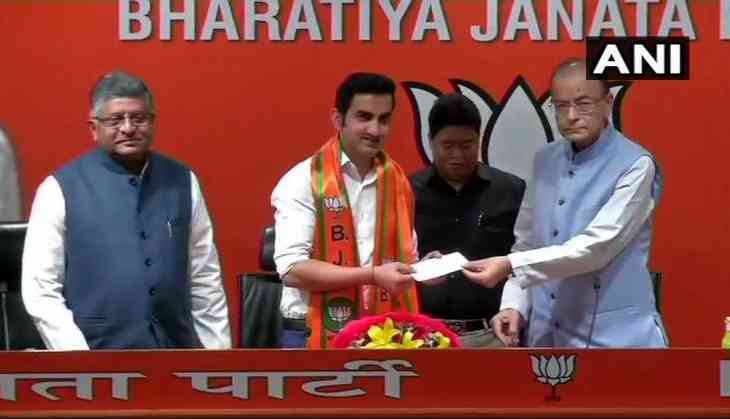 In a yet another event of cricketing players joining politics, former cricketer Gautam Gambhir has joined the BJP ahead of the Lok Sabha elections of 2019. Gautam Gambhir, at the event said, "I am joining this party(BJP) after getting influenced by PM Narendra Modi's vision. I am honoured to get the opportunity to join this platform." BJP had decimated AAP and Congress in the last elections in 2014, by sweeping all 7 seats of Delhi. And now, BJP has welcomed the former cricketer Gautam Gambhir, who as per sources might contest from New Delhi constituency. Gautam Gambhir, a resident of Rajinder Nagar, which falls within the constituency. Gautam Gambhir has been awarded the Padma Sri, has been non-committal about joining politics. Earlier, in 2014, Gautam Gambhir was a high-profile campaigner for Union Minister Arun Jaitley in Punjab’s Amritsar. However, Arun Jaitley lost the election to Congress's Amarinder Singh, now Chief Minister of Punjab. Former Indian opening batsman recently took retirement from all forms of cricket in December. Gambhir is known for strongly voicing his views on contemporary politics and incidents that have speculated of him joining active politics.